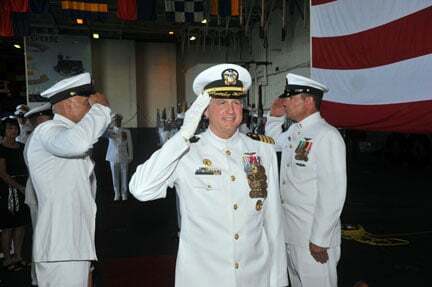 Captain William C. Hamilton relieves Captain Dee L. Mewbourne as Commanding Officer of USS Enterprise (CVN 65) in a shipboard ceremony at Norfolk Naval Station. Enterprise recently returned from her 21st deployment, where she served in the U.S. 5th and 6th Fleet areas of responsibility, conducting missions from counter-piracy and counter-terrorism to more than 1,450 combat missions in support of Operations Enduring Freedom and New Dawn. The eighth ship named Enterprise, she is the world’s first nuclear-powered aircraft carrier. On November 25, 2011 Enterprise will celebrate her 50th Birthday and kick-off a year-long tribute to her 50 years of service before her scheduled decommissioning next fall. NORFOLK-- Sailors assigned to the aircraft carrier USS Enterprise (CVN 65) welcomed a new commanding officer during a change of command ceremony, Aug. 17. Capt. William C. Hamilton relieved Capt. Dee L. Mewbourne as Enterprise’s commanding officer in front of the ship’s crew, friends and family in the hangar bay. 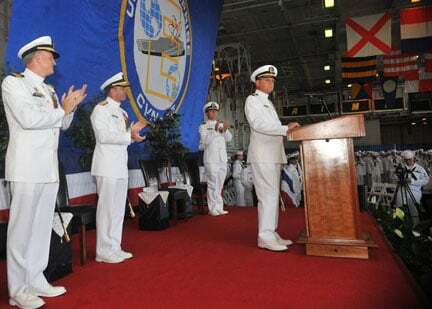 Rear Adm. Terry B. Kraft, Commander, Carrier Strike Group 12, presided over the change of command and spoke warmly about the accomplishments of Mewbourne, the entire ship’s crew and their ability to accomplish the mission. Prior to assuming command of Enterprise, Hamilton, a naval aviator who flew F/A-18 Super Hornets, served as Aircraft Carrier Requirements Officer for Commander, Naval Air Force Atlantic where he led efforts to upgrade and maintain the current fleet of aircraft carriers and integrate our newest carrier into the Navy. "We will continue to uphold the standards that have made this ship and its crew great," said Hamilton. "We will do everything in our power to ensure that USS Enterprise remains ready for tasking in response to our nation’s needs. We will keep Big ‘E’ ready on arrival." In recognition of his efforts as commanding officer, Kraft presented Mewbourne with the Legion of Merit. "I will wear (this award) proudly as a visible reminder of the outstanding efforts of the brave men and women who served selflessly, ensuring that Enterprise was always ready on arrival," said Mewbourne. Enterprise recently returned from her 21st deployment, where she served in the U.S. 5th and 6th Fleet areas of responsibility, conducting missions from counter-piracy and counter-terrorism to more than 1,450 combat missions in support of Operations Enduring Freedom and New Dawn. The eighth ship named Enterprise, she is the world’s first nuclear-powered aircraft carrier. On November 25, 2011 Enterprise will celebrate her 50th birthday and kick-off a year-long tribute to her 50 years of service before her scheduled decommissioning next fall. A few passing clouds. Low 63F. Winds SW at 10 to 15 mph..
A few passing clouds. Low 63F. Winds SW at 10 to 15 mph. Get our free Military News and Weekend Access newsletters delivered straight to your inbox. The 2018 Hampton Roads Navy Ball was held on Saturday October 13, 2018 at the Virginia Beach Convention Center. 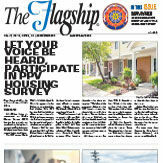 Enlisted Navy sailors and officers gathered for a night of dinner and dancing to celebrate the Navy's 243rd Birthday as well as the 25th anniversary of The Flagship newspaper. This parody of Mark Ronson and Bruno Mars' "Uptown Funk" depicts midshipmen on liberty in Annapolis, was made on a $0 budget, has more than 7 million views and won the "Geico Best Short-Short Film" in 2015.